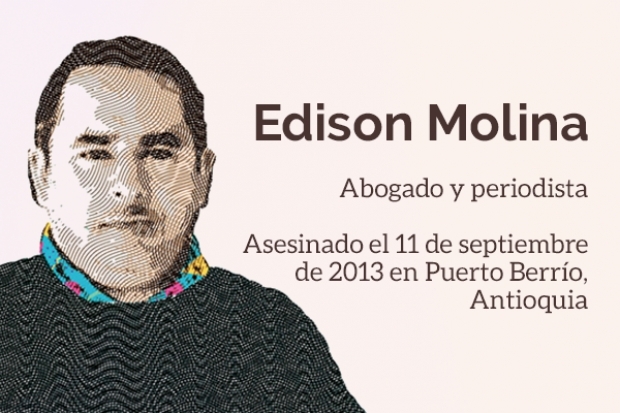 A Colombian court found the State responsible for not protecting the right to life of Edison Alberto Molina Carmona, a lawyer and radio journalist in Antioquia who was killed in 2013. The court recognized that Molina received threats because of his work as a journalist and as an opposition leader, and that they weren’t addressed in a timely manner by the State, according to the Foundation for Press Freedom (FLIP, for its acronym in Spanish). The sentence pointed to the National Police as carrying out their protective work late and in a poor manner and to the Attorney General for ignoring its constitutional and legal duties, FLIP reported. The organization recognizes the ruling “as an important precedent for the protection and security of journalism in Colombia, as it refers to the obligation of the State to provide timely and effective protection to journalists at risk." FLIP represented Molina’s family, which is entitled to economic reparations as ordered by the judge. The judge also called for a public ceremony for apologies to the family in the municipality where Molina was killed, as well as a workshop on human rights, freedom of expression and other themes, according to FLIP. FLIP called on the Attorney General to investigate the case –which no one has been punished for– with greater diligence. On Sept. 11, 2013, Molina was shot in the head as he was heading home in Puerto Berrío, Antioquia, in northern Colombia with his wife, who was injured. He was host of the radio program “Consultorio Jurídico” (Legal Clinic) on Puerto Berrío Stereo. Molina’s co-host said the journalist accused the government of corruption on the program, according to the Committee to Protect Journalists (CPJ). He also reported several threats in the months leading up to his death. “He had 60 lawsuits against the municipal administration, against the mayor and the government secretary,” said Molina’s wife, Luz Marina de la Pava, as reported by Caracol. The news organization added that an initiative called Movimiento Los Enanos has fought for justice in the case since Molina’s death.